Let’s imagine there’s a person in this world who takes pictures of food. Right, that’s definitely easy to imagine. Okay. Now let’s take this idea one step further and assume that the person sometimes doesn’t like crumbs in her (his) pictures and feels a strong need to remove them. Oh yeah, that’s a little weird. I agree. Maybe that person should see someone. Well, I don’t know whether a person like that exists. 1. Open the picture in Photoshop. 2. 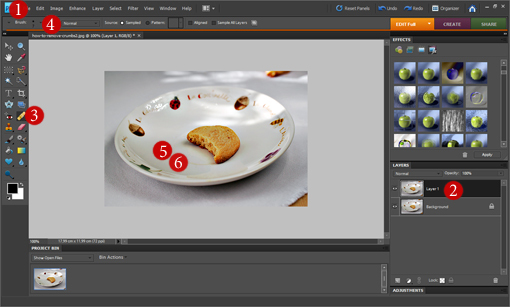 In the Layers palette, click on the Background layer and then press Ctrl+J (Mac: Command+J) to create a duplicate layer. Leave this new layer selected (highlighted). 3. Choose the Healing Brush Tool from the left-hand Tool palette. 4. On the tool options bar, set the brush diameter to a suitable size – you need it to be big enough to cover the crumbs. 5. Choose a part of the picture without a crumb which is close to the spot with the crumb. This is done to get a similar color and texture to replace the crumb with. Alt+click (Mac: Option+click) on the crumb-less spot. 6. Move the circle over the crumb and click your mouse. This should place the sample right over the crumb. Feel free to use this tool to replace any irregularities – crumbs, dust, wrinkles or people’s heads. Thanks for letting people know of these editing features. In a way, though, I kind of like the crumbs. 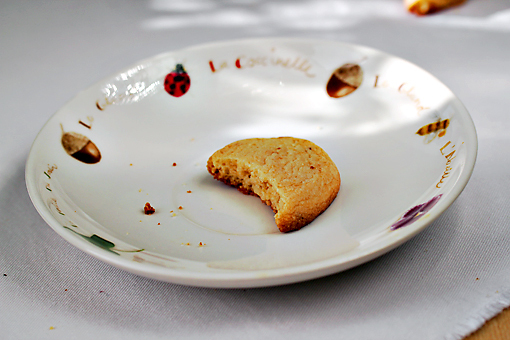 They leave a little trail … like someone just ate the cookie, put it down, and then took the picture. Kind of looks like action. Hey Petra! Nice site. Very inspiring for starting up on Food photography! To add to your tutorial: I alternatively use the Clone Tool (which is clubbed along with the Heal Brush) and change the Blend Mode (4) from “Normal” to “Lighten” (if it’s dark spots I want to remove) or “Darken” (vice versa). This helps reduce any brightness variations. It also helps to increase the softness and reduce the opacity of the brush. Then do multiple brush passes over your spots for a better merge. Hope it helps, and looking forward to more yummy posts from you! I definitely have the same pet peeve when it comes to crumbs in my pix and I turn to the Bandaid Tool a lot! I never seem to notice the crumbs until I look at my picture like they just popped up out of no where! Seriously awesome information, thanks so much for the info. Great post! I’ve been considering photoshop, I’m still too new to blogging and wasn’t sure if I wanted to invest the money. All the work you need to do to photos has been getting me down. You have lots of great tips on here, I’m looking forward to reading. Thanks.